This entry was posted on March 31, 2010 at 10:54 PM and is filed under food flotsam & jetsam. You can follow any responses to this entry through the RSS 2.0 feed. You can leave a response, or trackback from your own site. Happy 1st birthday, LettuceEatKale, and a few well-deserved tips of the champagne to you. It’s been quite a ride, and you’ve covered more ground than many bloggers/writers manage in thrice the time. Horn toots well deserved, and love the photo! Thank you, Ms. Melanie. You have one coming up soon too, right? Happy, happy birthday. From the name of your blog to your witty style of expressing so many interesting topics, you’re sure to celebrate many, many more! Thank you, Sheryl. Who knew such a quirky name would get so many compliments? Congrats on your first year! Here’s to many more to come. Thanks — and I’m sure I can learn lots of tips & tricks from a seasoned blogger such as yourself! Congratulations. It only gets better. Good to know, Roxanne. Thanks. Congrats on your one year blog-anniversary! I enjoy your site so much and always come here ready to be surprised. Wishing many more successful years. Nice to know I surprise ya sometimes, marthaandme. And thanks for the kind words. Well done you. Keep it up! Looking forward to your new self-hosted incarnation. Thanks, Frugal Kiwi. And me too (on the hosting front). Love your blog! I’m looking forward to many more fun, insightful blog posts. Thanks MKES. And speaking of fun blog names, I’ve always loved your moniker. Looking forward to your new celebrity status and six-figure book deal, dahhling. Congrats for making it this far. Perseverance is an excellent skill. Written like the top-notch writing coach that you are, DJ. Over the past year I’ve happily learned lots about things I didn’t even know I wanted/needed to know about, found out about local options and activities I’d never have known about otherwise and been introduced to people in my community that I’m really pleased to be aware of and would never have stumbled across otherwise. Looking forward to each new blog in the coming year and hopefully many more! Thank you, Michelle, I love that people from my regular life like to read my ramblings — like you don’t hear enough of it in person:). I so appreciate your funny and insightful comments, often after others have weighed in and frequently with a totally different POV. Looking forward to stumbling around some more in year 2 as well. Deal! So glad to get to know you in the virtual world, Jane. And so appreciate the hand holding in those early, uncertain days. Happy One Year to LEK! I really enjoy this blog. It allows me to dream of living in a balmy California with sensible folks who shop in open-air markets and pay attention to what their children eat. In the second year, I would love more visits to organic gardens and a report on whether/how the EPA effort to limit toxic chemicals in our environment, led by Lisa Jackson, is finding support among the local foodies and/or organic gardeners. Duly noted, Alexandra. I’m a bit of a fair weather farmer myself, but now that Spring is here I intend to make more of an effort to gather reports from the fields. And thanks for the kind words, though I’m not sure how sensible I am. Thank you LWG. And thanks for stopping by. I look forward to meeting you in person at IACP later this month. It’s always a pleasure hanging over here, and I look forward to doing so on your new hosted blog. Now can I have cake? As for cake…can you imagine some? That’s about as real as it’s gonna get. Never thought you’d turn 1 again, eh? Keep up the good humor, mate-love reading your posts, always funny, always informative. Let me know when you get that 6 figure deal-will treat you to burritos, hah!! Nice to see one of my new food friends in the mix. Thanks for your sweet comment and have no fear, the burritos will be on me! Love your blog, Sarah. Happy birthday! Thank you, Ruth. And for your sweet message offline as well. Congrats, Sarah! I’m newish to the site but really love it. Hi and welcome, Camille. New is good. Come join the party. Congratulations! I certainly hope that you made a nice cake for your blog’s birthday. Hi Roz, nice to see ya here and thanks. I have loved the name of your blog so much since I first heard of it. And like Camille, I look forward to reading it more. 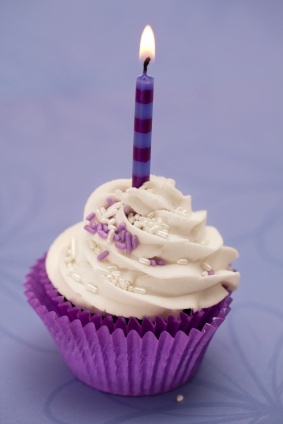 Happy 1st Birthday to your blog, Sarah! I love the vivid photos you use and the passionate, in-depth way in which you write about food. Keep up the great work! P.S. Somehow I missed that you were mentioned on the NYT Bay Area Blog, but that deserves kudos, too! Hey Susan, Thanks for your sweet note. Happy birthday blog! That’s quite an achievement! Congrats on your blogiversary! I can’t believe your fantastic blog is just a year old. Even though I don’t have kids, I do have lots of nieces and nephews, so I’m very glad to have found you. I like that — blogiversary — thanks, Jesaka. And if you tool around the archives a little you’ll see that I write a lot about food stuff for adults as well. Happy Birthday Lettuce Eat Kale. Sarah – You’re real. That’s what I like about this blog. You are a real person out there living, learning, having fun with what is going on in the Foodie world. And, you made me feel special for a day too! I had the pleasure of making a new friend in you! 🙂 So, yes…I will be a reader for a long, long time. Besides the fact that you are an entertaining writer. Thanks Anna, for your lovely message. One of the best parts about this blogging business is getting out in the real world and reporting on what people like you are doing to make a difference. It’s always inspiring to discover what someone is doing to make their community a better place for everyone. So I take my hat off to you, Lemon Lady, and others like you. Is there anything I miss? Lots of stuff, my dear, the job of a journalist is never done but I have a great time trying to cover as much of the food beat as I can. There you are! So nice to hear from you, Jac. Thanks for the kind words and for all your support on this little experiment. Thanks, Jane. I really appreciate your feedback on my posts — and your strategic behind-the-scenes input. And, thanks too, for spreading the word in Singapore. Would love to celebrate with you in person — and soon — but who knows when we’ll be in the same country again??? Aw! Happy Birthday to you LettuceEatKale! Your posts are always so fresh I foresee many more birthdays ahead! Why thank you, Ms. M. I certainly hope so. Sorry so late with my congrats (was food-touring in NYC). Glad to see all your well-deserved support! Happy Birthday! One thing that would be fun is maybe a how-to, cooking demo, or maybe a visit to a local restaurant owner video! Keep up the awesome work Sarah!